Abuja Music Fiesta happening this Sunday! Music: Timaya / Kiss Daniel /Ycee /Reekado Banks /Yung6ix // Rayce / Lk Kuddy/ Prokassy….. Comedy : Osama // Acapella // Kenny Blaq // ChuksDgeneral // YellowMouth //Stainless // Sam and Sung …. Check Out Tiwa Savage Attire. 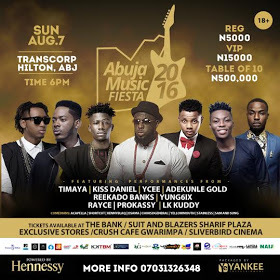 Hey Buddy!, I found this information for you: "Abuja Music Fiesta happening this Sunday!". Here is the website link: https://360kwado.com/abuja-music-fiesta-happening-this-sunday/. Thank you.